Introduction: Laparoscopic surgery has problems associated with two-dimensional image projection and loss of alignment between the surgeon’s hands and visual field. Data from the Society of American Gastrointestinal and Endoscopic Surgeons (SAGES) reports that 8% to 12% of the surgeons suffer from frequent pain in the neck and upper extremities. Head mounted display (HMD) is a novel technique, which aims to normalize the visual-motor axis. With this technique a monitor is connected to the surgeon’s head in a similar fashion to goggles, and the power supply pack is fastened to the surgeon’s back, making the mechanism portable, light, and allowing a central and peripheral view, improving ergonomics. Methods: Six patients were surgically treated using a HMD. Three appendectomies and three cholecystectomies were done with laparo-endoscopic single site (LESS) technique. All procedures were performed by the same surgeon. Results: The device had adequate resolution for the purpose of LESS and procedures were carried out successfully. The goggles were comfortable to wear and the peripheral view was adequate. They also eliminated significant torsion of the surgeon’s neck and allowed simultaneous view of the patient and the surgical field. Conclusions: Laparoscopic surgical technique is more taxing on the surgeon while a HMD enables a more relaxed position by aligning the surgical visual gaze with the instruments. 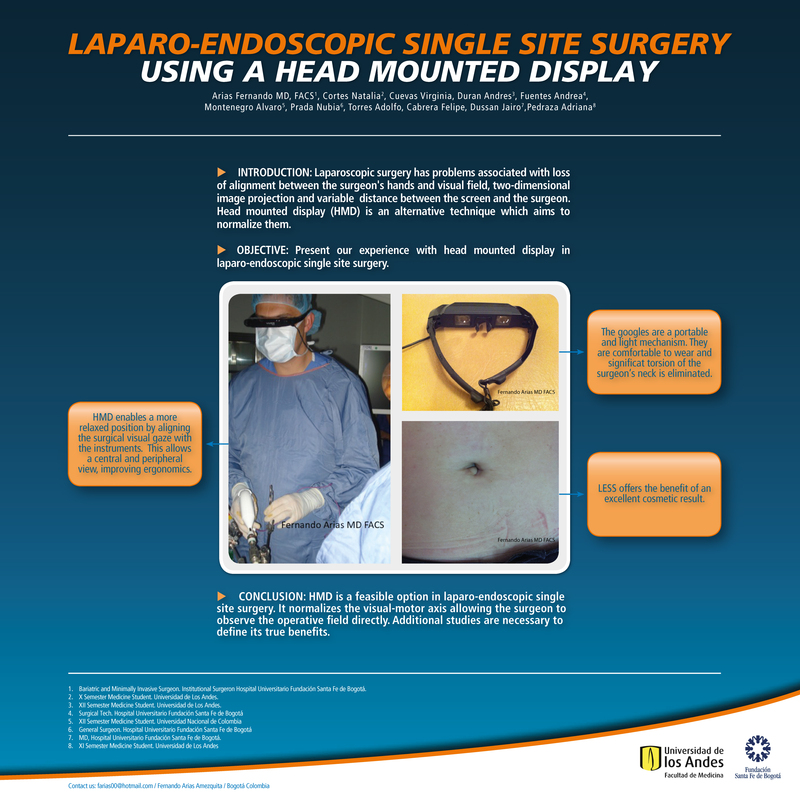 The use of a HMD is a feasible and safe option in laparoscopic surgery. Additional studies are necessary to define its true benefits.